Music can calm and soothe us and lift our mood. Research suggests that music has the same effect on our pets. But the types of music and sounds that appeal to us will not necessarily appeal to our pets. Cats and dogs have much better hearing and wider frequency sensitivities than we do, so what is the best music to play for them? We’ve all noticed that our pets react to certain sounds and tones - they may appear to be quite happy to listen or may bark, howl or race from the room. Many of us leave a radio, television or music on for our pets when we head out. We believe that it will comfort and reassure them and act as an auditory distraction for dogs with noise phobias or separation anxiety. However, the music could relax them, annoy them or actually have no effect whatsoever. Animal psychologist Charles Snowdon, studies the connection between animals and music. He realised that animals prefer ‘species-specific music’ and now scientists and researchers are developing musical compositions that use the sounds, pitches, tones and rhythms that form a species’ natural communication structure. Humans generally like music with tones similar to our own vocal range – anything higher or lower can be irritating to listen to. Music with a rhythm and beat matching our resting heart rate tends to relax us whilst quick rhythms stimulate us. It is the same for our pets but their vocal ranges and heart rates differ greatly from ours. A cat or dog's sense of hearing is many times more sensitive than ours. They hear frequencies that are too high for us and we have no chance of even detecting. And as for volume, any sound will seem much, much louder to them. Unlike us, cats and dogs seem to prefer simple compositions and melodies. Whereas the different breeds of cats have a fairly consistent vocal range and heart rate, in dogs these characteristics vary according to breed and size. Large dogs have vocal ranges similar an adult man so may enjoy some of the same music that we do. Psychologist Deborah Wells researched how music influences the moods of dogs. She played them compilations of pop, classical and heavy metal music as well as recordings of human conversation. Heavy music caused the dogs to bark and become quite agitated. Listening to pop music or human conversation appeared to make little difference with the dogs’ behaviour matching periods when no music or recordings were played. Classical music had a calming effect on the dogs. Aaaww!! 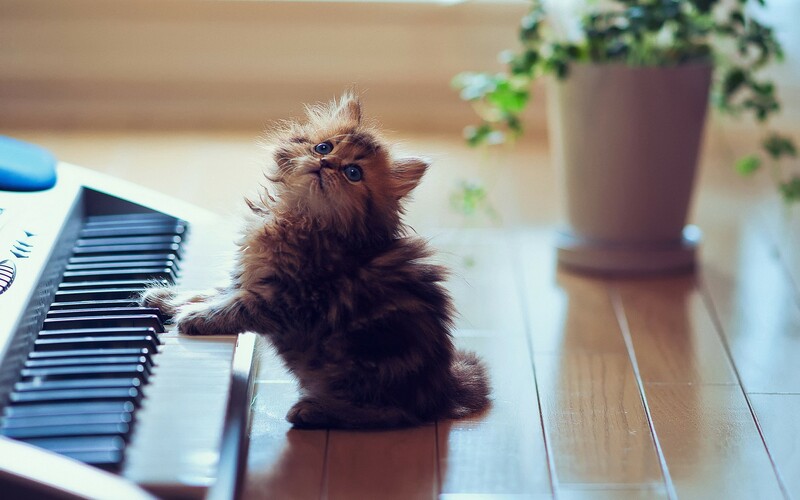 it is too cute to see pets with play music I love your blog to much. I also have a dog which reacts on the sound of music https://harrypottermusicbox.com/ is it is excellent block. I love it.